A great choice for small to medium size ponds from approximately 1/2 acre (150’ x 150’) to two acres with a minimum depth of 19 inches. 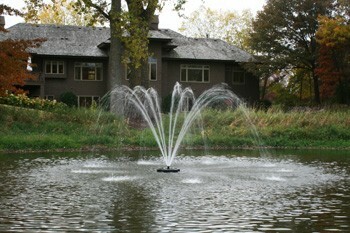 Two smaller fountains can always be considered versus a single larger powered fountain. You can start with one and add a second fountain later. 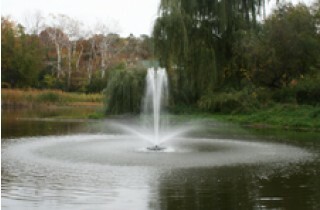 A time tested stable mate of the Kasco fountain lineup delivers the benefits of aeration and the beautiful display easily found within the multiple nozzle choices included. A reliable motor with a two year warranty. We also include a “quick disconnect” on the power line for ease of installation/removal. Need to know more specifics? Click here for a downloadable 4400JF manual. Maximize the full potential with an optional LED Lite Kit. No one has ever regretted the return on investment when they first see their fountain lights turn on at dusk! Consider the ease of minimal maintenance, long life (Up to 50,000 hours) and economy of these beautiful LED lights. Five different color choices included. Take a moment to visit the LED lighting page. *Wire gauge increases with length. Longer lengths available. No electrician is required to install the C-25 Control panel or the 4400JF if an existing 120 Volt, 15 amp receptacle is available.